The largest of the Canary Islands, Tenerife came under Spanish control in 1495 after some hard fought battles with the local people known as Gaunches. The Spanish developed the island for agriculture, using the produce to re-stock ships on route from Spain to the Americas. The British the value of Tenerife's strategic position and made two separate attempts to capture them - the first being the occasion when Lord Nelson lost his right arm. The island has of course remained Spanish and has become a major tourist destination, particularly in winter months when it's relative nearness to the equator ensures temperatures nearer to those of summer in much of Europe. The Tenerife Climate varies between north and south, with the prevailing north easterly winds (which keep the summer temperatures bearable) dropping most of the rain that the island receives, before getting to the higher central ground. Consequently, the more northern parts of the island have much more of a natural greeness to them, and were originally the main developed areas. The south of the island, with less cloud or rain, was more attractive to tourists and has been extensively developed. Santa Cruz de Tenerife, the capital of the island lies on the north east coast and it's port has always been important to the island. It is a city of over 200,000 inhabitants, with tree lines avenues, parks and squares. Puerto de Santa Cruz, lying on the north west side of the island was originally the main tourist area, and is still the main tourist destination of Northern Tenerife, is lacking in natural beaches but makes up for this with manmade facilities, the Lago Martianez, in attractive surroundings. 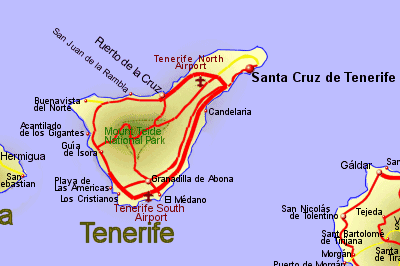 Popular holiday destinations in Southern Tenerife include Los Cristianos, Playa de las Americas. The main feature of central Tenerife has to be the volcanic summit of Mount Teide, rising to 3718m or 12200 feet, itself sitting in a sunken crater 15Km across, the whole area being a National Park.